Anyone know what these loose wires are? I have a '17 Q7 Prestige which recently had the rear upper bumper replaced and painted by an independent repair / body shop. To do so, I they expect that they had to take the whole two piece bumper assembly apart and off the vehicle, replace / repaint and reinstall. I was initially going to have the work done by my local Audi dealer in Dayton, OH (US), but found out that they are not Audi "certified." 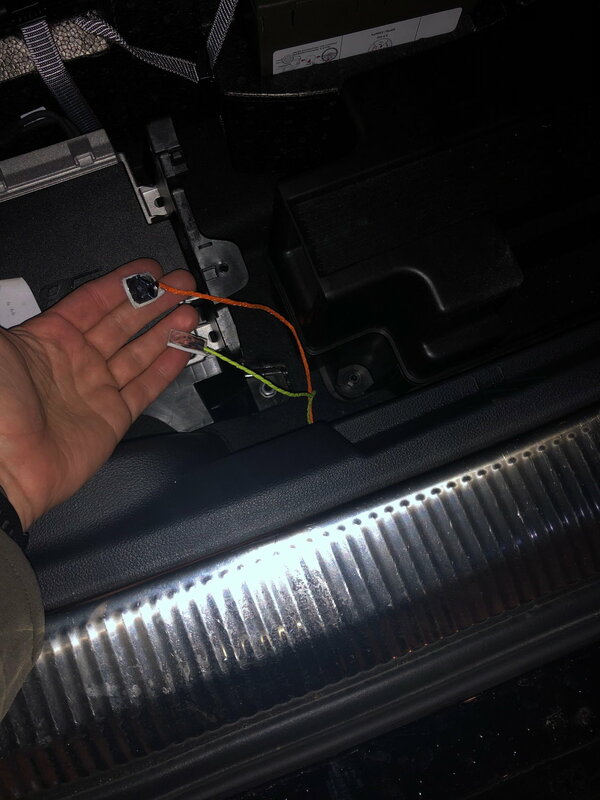 I initially thought that the wires were the automatic trunk opener sensors which detect when the foot is swung underneath the bumper, that perhaps the shop left off, but I've tried that function and it works. Upon sending the picture to the body shop, they aren't sure. They contacted the local Audi dealer, and the lead tech said that they are humidity sensors that are only used when the vehicle is transported or waiting at the dock. Does that make sense? Suppose it could. The two wires are wrapped with a foil tape at the end, and don't appear to have any connectors on them. I was initially going to have the work done by my local Audi dealer in Dayton, OH (US), but found out that they are not Audi "certified." Your Audi dealer is not Audi certified? huh? He probably means for body work repairs (aluminum body panels). Yes, correct, they were not Audi certified for aluminum body repair. Come to find out, there are two levels, I believe, of certification. One, being for aluminum surface repairs such as for fenders, and another for structural, such as for the frame. The new service contact person, thought they were certified, checked on it while I was on hold, and said "yes"
I doubted it, and called AOA who verified they weren't certified in either. As they weren't I didn't feel it was necessary for me to pay extra for a non-certified job, and hence went to a good local repair shop, with a good reputation for working on Audis and BMWs. So, no take on the loose wires? If humidity sensors, would be nice to access the data withing OBD11 gauges, at times. Six things come to mind that'd be wired in the bumper... rear bumper lights, towing connection, parking sensors, rear radar (w/DAP), rear proximity for keyfob and handsfree open... my guess would be handsfree open or rear proximity... everything working? maybe these wires were abandoned? Can you close the hatch with the keyfob? Yes, the key fob works, to close the trunk hatch. Suppriae that no one else seems to have seen these wires .... nor has an idea what they are for / or can confirm that that are humidity sensors! Ha ha ha. Humidity sensors! Those are clearly the wires for the trans-flux capacitor. You may notice slight irregularities transitioning to speeds above Warp 13 while entering wormholes if they are disconnected. Seriously, something is disconnected and that’s the lamest explanation I’ve ever heard. You’d need a wiring diagram and to trace the wires to find out what’s really going on. I don’t have any loose wires on mine.